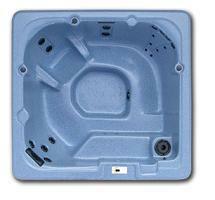 The Daisy (72" Round x32") combines the features of the original hot tub with the benefits of modern hydrotherapy. The Daisy is ozone ready and features Garden Leisure's unitized frame construction, a 2 lb. density foam insulation barrier that offers the ultimate in heat and money-saving benefits. Digital topside controls, maintenance free skirting and built-in safety features like a molded step and underwater light make your Daisy spa a truly perfect experience. The Azalea (60" x 82" x 30") offers the perfect blend of space-saving and high-performance features. It has a lumbar support lounger with padded headrest and two deep bucket seats. The Sunflower (78" x 82" x 32") is a truly unique spa. Entry and exit is a snap with steps going right down into the spa. 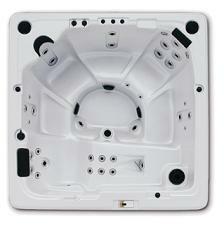 Five adults can comfortably use the Sunflower, and all controls are within easy reach - perfecting your spa experience. The Desert Rose Platinum (82" x 82" x 36") comes with all the features of the Desert Rose and also includes an AM/FM/CD stereo system and stainless steel jets. LED spa mood lights located in the footwell change color. The Desert Rose Platinum is available in unique colors not available on the Desert Rose, and includes an ozone water purification system. The Camelia (92" x 92" x 36") has 33 therapy jets designed to target specific areas of the body for the ultimate relaxation massage. This model seats 6 people and holds up to 400 gallons of water. The Jasmine Platinum (92" x 92" x 36") is our largest spa, with roomy seating for six. Stainless steel jets, an AM/FM/CD Stereo System and a Laminar Waterfall are just a few of the luxuries this premium spa showcases. LED spa mood lights located in the footwell and along the top of the spa change color adding to your spa experience. An ozone water purification system is included.